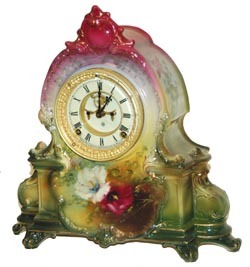 Ansonia Clock Co. Royal Bonn, "La Manche", C. 1904. Another large case standing 13.75" high, 14" wide, all the necessary markings on the case to substantiate what it is. Great colors beginning with Ruby Red on top, slowly changing to dark green on the base. Six feet support the case. The case designer or mold maker must have worked overtime to design such a beautiful case. Excellent 2 piece porcelain dial, open escapement, hands, back cover, and pendulum. The movement is 8 day, runs well and as usual strikes the half hour and hours on a gong. This clock is in excellent condition, and is bright and clean. American sash, beveled glass. This is an outstanding, colorful clock. Ly-Ansonia, page 615.